PTR records are most commonly used for reverse DNS or mapping an IP address to a domain name. Because this is the most common usage, this article will focus on it. 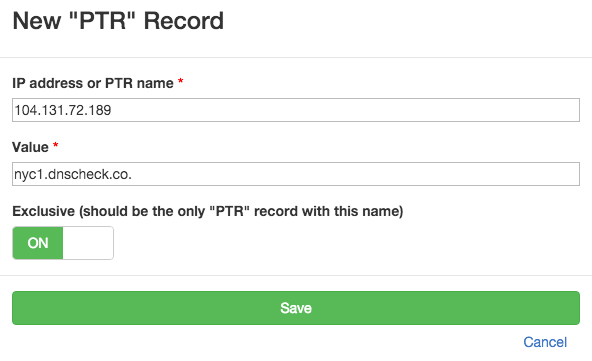 PTR records are also called "Pointer Records," and are defined in RFC 1035. DNS Check can monitor your reverse DNS records, and notify you if they become unresolvable, or start resolving to the wrong domain name. If you're using some other type of PTR record, then DNS Check supports monitoring it as well. Reverse DNS gets its name from the fact that it does the opposite of what A records do for IPv4 and AAAA records do for IPv6. A and AAAA records are referred to as "forward DNS" records because they map domain names to IP addresses. Reverse DNS (PTR) records, on the other hand, map IP addresses to domain names. The 189.72.131.104.in-addr.arpa PTR record points the 104.131.72.189 IP address to nyc1.dnscheck.co. The nyc1.dnscheck.co A record maps to 104.131.72.189. The 1.0.0.b.1.a.7.0.0.0.0.0.0.0.0.0.0.1.0.0.0.0.8.0.0.8.8.a.4.0.6.2.ip6.arpa PTR record points the 2604:a880:800:10::7a1:b001 IP address to nyc1.dnscheck.co. The nyc1.dnscheck.co A record maps to 2604:a880:800:10::7a1:b001. It's common for spam filters to check whether the IP address of a server that's attempting to deliver mail has matching forward and reverse DNS records. Servers whose IP addresses lack matching forward and reverse DNS are subject to having their mail deferred, rejected, or sent to the spam folder. Matching forward and reverse DNS is a prerequisite for registering for most email feedback loops. Email feedback loops, which are also sometimes called "complaint feedback loops" are a mechanism that ISPs use to share information about spam complaints with email senders. These provide a useful metric of how "spammy" email is and are used to identify abuse issues. As you can probably see from the earlier sections, PTR record names, especially in the IPv6 space can be unwieldy. Name A fully qualified domain name (FQDN). 189.72.131.104.in-addr.arpa. Value The fully qualified domain name (FQDN) that the PTR record points (resolves) to. nyc1.dnscheck.co. IPv4 and IPv6 PTR records go in separate zone files. RFC 1035 - this RFC defines PTR records. See section 3.5 - "IN-ADDR.ARPA domain" in particular.